Let's figure out which version of OneDrive isn't syncing. "OneDrive - Personal" or "OneDrive"
"Files are up to date"
Make sure that the file you want to sync isn't larger than 15GB. Try reducing the size of the file by zipping it. Note: The OneDrive file size limit is 15GB. If you're trying to sync a file that's too large, you might see an error message such as "This file is too big to upload" or "Reduce the size of this file to upload to..."
Make sure you have the latest Windows updates. Download the latest Windows updates. In Windows 10, go to Start, type OneDrive in the search box, and then click OneDrive. In Windows 7 or Windows Vista, go to Start, type OneDrive in the search box, and then click Microsoft OneDrive. This opens your OneDrive folder and starts the OneDrive app. Go to Start, then select Settings > Accounts > Email & app accounts. Select Add a Microsoft account. Follow the prompts to switch to a Microsoft account. You may need to enter a confirmation code. 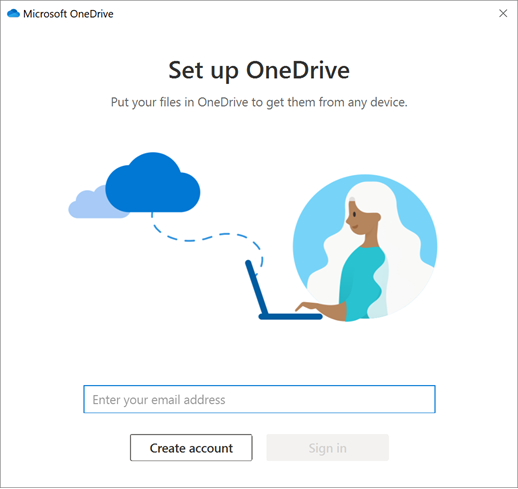 Note: If you’re signed into Windows with the Microsoft account you use for OneDrive and you still don’t see your files, your organization may have a corporate firewall or Group Policy that blocks OneDrive. If you’re signed into Windows 10 with the Microsoft account you use for OneDrive and you still don’t see your files, you may have more than 500MB of content and setup didn't finish. To make sure you don’t fill up your PC with OneDrive content, you can select which files and folders you want to sync to this computer. Click the OneDrive folder. In the Finish setting up OneDrive wizard, select the files and folders you want to sync to this computer. Unlike in Windows 8.1, OneDrive in Windows 10 doesn’t use placeholder files to indicate files that are online only. Instead, you see only the files you choose to sync to your computer. If you haven't synced the folder that contains files you want to sync, you won't see those files. 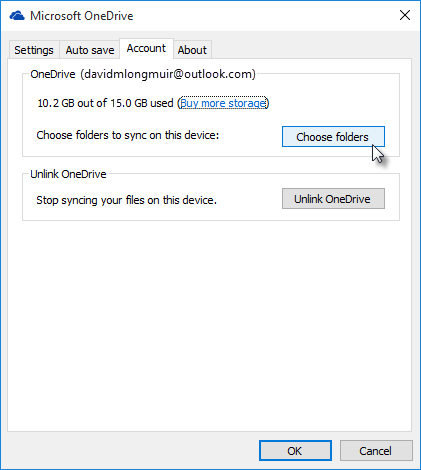 If you’re having trouble syncing Office files, the Office Upload cache system may be interfering with OneDrive sync. Try turning off the related setting in OneDrive settings. Select the Office tab, and uncheck the Use Office 2016 to sync Office files that I open check box. Important: When you turn off the Use Office 2016 to sync Office files that I open setting, any changes that you and other people make to Office files in your OneDrive will no longer merge together automatically. The entire path, including the file name, must contain fewer than 400 characters. Shorten the name of your file or the name of subfolders in OneDrive, or select a subfolder that's closer to the top-level folder. Try to open the file or folder and make sure that you have permission to save a copy of it. If you're having problems seeing a file on a network, contact your network administrator. You may have conflicts if you're uploading multiple files on the OneDrive website at the same time, or if you made changes in your OneDrive folder on another PC that is syncing at the same time. Rename the file or folder, and then try to add it again. Check your Storage page on the OneDrive web site and compare the size of your OneDrive to the available disk space on your PC. If necessary, move or delete some files. Select Exit, and select Close OneDrive. Go to Start, enter OneDrive in the search box, and then click OneDrive. Follow the steps to select your OneDrive settings again, including picking the location of your OneDrive folder and choosing whether to turn on the Fetch files option. If OneDrive sync seems to be stuck for a long time and nothing else is working, try a reset. Be aware that resetting OneDrive re-syncs all your OneDrive files, which could take some time depending on how many files you’re syncing. Select the Start button, type Programs in the search box, and then select Add or remove programs in the list of results (in Windows 7, click Programs and Features.). Find and select Microsoft OneDrive, and then select Uninstall. If you're prompted for an administrator password or confirmation, type the password or provide confirmation. Install the new OneDrive sync client. Select the Start button, search for “OneDrive”, and then open the OneDrive desktop app. When OneDrive Setup starts, enter your OneDrive account, and then select Sign in to set up your account. Make sure you have the latest Windows updates. Install the latest Windows 8.1 Update. Make OneDrive check again for changes - In the OneDrive app, swipe up from the bottom or right-click, then tap or click Sync. Sync problems can sometimes be a problem with missing files. To find missing files, see Find lost or missing files in OneDrive. Note: If you get the following message, you don't need to do anything: "We’re checking all your files to make sure they are up to date on this PC. This might take a while if you have a lot of files." This means OneDrive has detected a possible problem and is automatically fixing it. Tap or click Options, and then turn on Sync files. Tap or click Metered connections, and turn Upload and download files over metered connections and Sync and backup settings over metered connections settings to On. 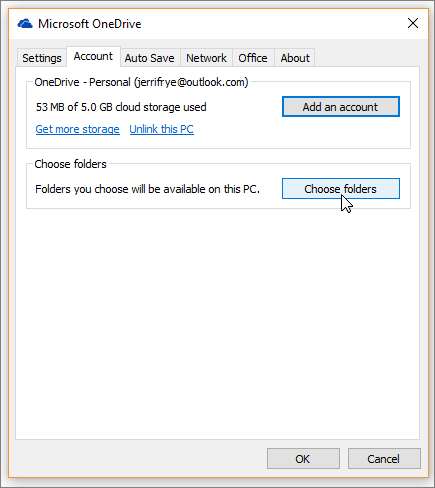 In File Explorer, right-click the OneDrive folder, and click Sync. Press Ctrl + Shift + Esc keys and select Task Manager from the menu. Tap or click the Services tab. You might need to select More Details to expand the Task Manager window. Look for WSearch under Name, and verify the Status shows Running. Right-click WSearch, and then click Restart. Tap or click the Details tab. You might need to select More Details to expand the Task Manager window. Look for SkyDrive.exe under Name, and verify the Status shows Running. In the Task Manager window, select File from the top toolbar. Open File Explorer and find the executable file for your program (example: iexplorer.exe). Right-click the program name and select Properties. Click the Compatibility tab and check Enable this program to work with OneDrive files, then click OK. Follow these steps to fix issues in OneDrive for Business as an Office 365 business subscriber. Download and run the Support and Recovery Assistant for Office 365. When you run it, choose the OneDrive for Business option and follow the on-screen instructions to resolve your issues. For help downloading and using the Support and Recovery Assistant, see Fix Outlook and Office 365 issues with Support and Recovery Assistant for Office 365. Right-click the blue OneDrive cloud icon in the notification area, at the far right of the taskbar. Right-click the blue or white OneDrive cloud icon in the notification area, at the far right of the taskbar. Make sure the OneDrive icon in the notification area of the taskbar disappears and then re-appears after a minute or two. Here’s how to check: Look for the blue OneDrive cloud icon in the notification area, at the far right of the taskbar. OneDrive for Business is frequently updated. Make sure you have the most recent updates. Tip: If you sync only OneDrive for Business accounts associated with Office 365, you might be able to use the new OneDrive sync client. To find out more, see Get started with the new OneDrive sync client in Windows. If you're using a Mac, see Get started with the new OneDrive sync client on Mac OS X. If you don’t have Office 365 and you need the OneDrive for Business sync app, you can download it free. If a file or folder name contains certain characters or file types, you won’t be able to sync those files. Review the list of invalid characters and file types, and change any file or folder names, or remove the file types that aren’t supported. If you’re having problems with a synced library folder, it’s sometimes simplest to just stop syncing the library, and then start syncing the library again, as if for the first time.